We've heard you loud and clear, not everyone wants to refill their containers with colored wax. 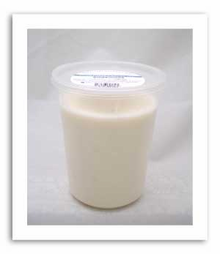 We've taken some of our most popular fragrances and had the factory produce them in creamy white wax. Same intense fragrance minus the coloring. The white wax works perfect for layering different colors and fragrances when you are refilling glass containers.